It isn’t trivial, slimming down a selection of 16 photos from 6000 candidates… Not that all 6000 are good, but probably 1000 or so are in the same ballpark as the 16 I chose (not that I’m claiming they’re anything special). Anyway, hot(-ish) on the heals of my Pyramiden & panorama galleries, here’s another more general set from the wonderful Arctic world of Svalbard. And for those who like to know these things, they were all taken with an Olympus E-3, using Zuiko Digital 12-60SWD, 50-200SWD and 7-14mm lenses. These are masterly - have you also posted to Flickr? I particularly like the blue/white tones of the glacier pictures. Believe me, they are breathtaking, and I can very well say that, because I know very well what I have seen. These images faithfully transmit the feelings of the strangest (maybe because it was the most northernly? )summer that I’ve ever seen. 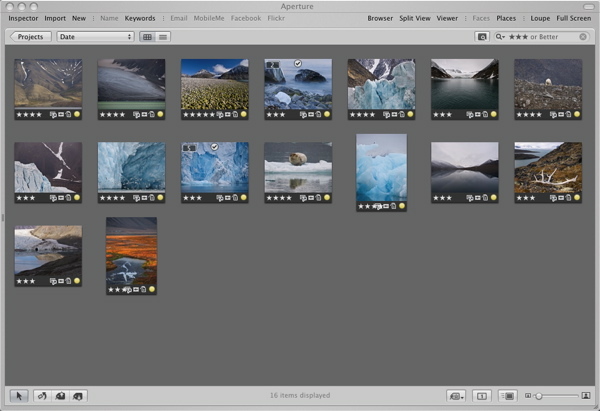 This is an impressive portfolio .... particularly the glacier ice images. Tones are perfect….